In the children’s literature world there are classic picture books known for their definitions of love. Guess How Much I Love You and On the Night You Were Born are two that instantly come to mind. While I will never tire of stretching out my arms wide to say I love you “thisssss much,” I’ve noticed that across these stories the characters are almost exclusively animals and that perhaps representations of human love can be just as powerful, if not more so, than personified love. In How Far Do You Love Me? by Lulu Delacre, a new classic is born: one that celebrates love and belonging. The book commemorates the places we’re from and the dreams we have. It honors the different ways love looks and sounds in real, human terms. How Far Do You Love Me? gives parents and teachers an opportunity to share a story that features people from different corners of the world using their geographical locations as references for how great their love is. My one-and-a-half year old poured over the images in this book closely reading the people and places. My four year old used our reading and rereading of this book as an opportunity to invent his own pronouncements of love using our geographical markers as his references. I love you over the tops of the trees and down to Merwin Meadows and back. I love you around the maple tree and over the clouds. I love you past Granny’s house and down to the beach. from How Far Do You Love Me? 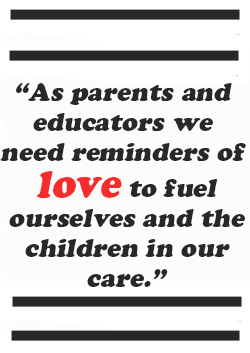 As parents and educators we need reminders of love to fuel ourselves and the children in our care. As the educational landscape shifts, as reforms standardize teaching and learning, as anxiety trickles down from leaders to teachers to students, we need love now more than ever. When I work with college students who are struggling to explain what they believe in as teachers, I let them know that their love for their students will matter more than any individual lesson and that their love will not be measurable on any standardized test. I have a new book to read to them in How Far Do You Love Me? and a new question to ask them: how will your students know how far your love will go? This week I was fortunate to learn I wasn’t alone in thinking about love in education spaces. This blog post by Mary Ann Reilly tells where love fits into her work. Mary Ann describes how love is the catalyst behind the innovative techniques she encourages teachers to use; how love needs to come out of the shadows in schools. I couldn’t agree more. I also returned to the film Children Full of Life, which showcases a classroom where love and happiness are centered above all things and where the children shout out that their goal for the year is “to be happy!” A classroom that frames happiness as the biggest goal is one where love is present. Yet in this classroom love is not portrayed simply through smiles and laughter. Love here is heart-wrenching and real. We need these models of love in our schools. Back at home, after reading How Far Do You Love Me?, we listened to “All You Need is Love” by the Beatles. My four year old raced off to add some new dinosaur stampings to a card he made me yesterday. This was his expression of love. That night my one-and-a-half year old woke in the middle of the night and instead of crying out for “mama” or “milk,” he repeatedly pleaded “books,” “books,” “books.” I believe it’s no coincidence that earlier that day we had read Lulu Delacre’s powerful book, a reminder and testament to the universal importance of love. When you read it, not only will you feel reinvigorated by the power of love but you may even inspire some fledgling book lovers too. I added this book to the common core project. It’s a gem. Wonderful!! No end to how much I LOVE this article! Thank you!